Dry: Overwhelmingly flowery and tart. The sort of overwhelming that makes me think this tea will be gross. All flowers. No tea. Just flowery, citrusy froo froo stuff. 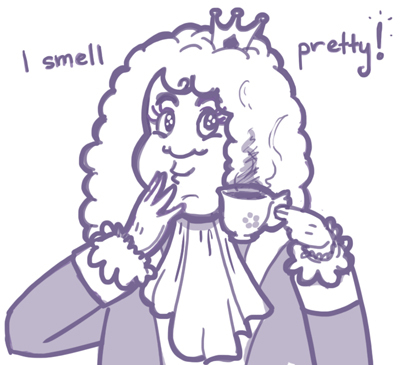 For an Earl, he smells like a princess. Aroma: Oh THERE’s the tea. Post-brewing it smells like black tea first, tangy flowers second. Flavor: Black tea and a bit of citrus. Nothing like what it smelled like in the bag. Bit of a slick, oily mouthfeel. Nothing too special or crazy. Bonus! What I did like about this tea, is that when I got back after the camp, my kitchen smelled pleasantly of bergamot (not the overwhelming bag smell) since I left the bag on the counter. In fact, even after I tossed the bag in the garbage, it made my garbage smell better. I’m not a super huge fan of Tazo tea bags, but this one did the job suitably and I was able to function at a level somewhere just above Zombie. Tea Score: 60 – It’s tea bag Earl Grey. It’s decent. Cupboard Score: 68 – It’s convenient, quick, and easy for a morning cup. I also don’t feel terrible about oversteeping it or just plain forgetting it as I run out the door. Not gonna cry if it’s not in my cupboard but it’s good for what it is – a quick caffeine fix.